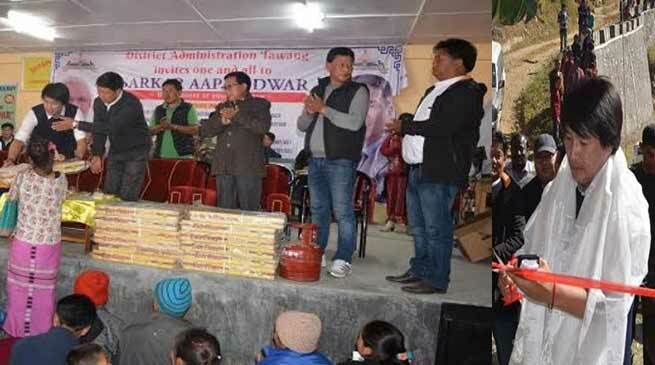 Jambey Tashi, MLA 1st Lungla Assembly constituency alongwith DC Tawang Sang Phuntso inaugurated the 12th round of Sarkar Aapke Dwar at Circle headquarters Dudungkhar Circle under Lungla Sub division on Oct 9 . This round of camp was organised to provide benefits of Government at doorstep to the villagers of Buri, Blet-teng, Dongmareng, Tsang-khar, Lou-dung, Namtsering, Dudungkhar, mahling, Guntse and adjoining hamlets. Speaking on the occasion MLA Jambey Tashi informed the villagers about the benefits of Sarkar Aapke Dwar camps and to avail maximum benefit out of it. He further said that govt. has launched many welfare schemes but due to lack of information and ignorance we fail to avail those benefits, the area under Dudungkhar circle has ample scope for horticulture, and we have to bring these lands under maximum cultivation of horticultural crops. We have to educate and motivate our youths towards this field, and must avail various govt. schemes like MUDRA etc. Informing about the implementation of UJJWALA Yojana MLA said that till so far 123 female head of the family are benefitted with this scheme under Zang-lum ie Dudungkhar circle administration. On this occasion also MLA Jambey Tashi distributed 32 numbers of Gas connection with stove and cylinder. MLA further distributed Yarn to 62 numbers of progressive weavers under Chief Minister’s Indigenous textile promotion scheme, and felicitated school toppers of classes five to Eight of Dudungkhar and Guntse Middle schools. MLA and DC further made rounds of the various department stalls and inquired about EVM, VVPAT machines, functioning of the departments and also preparedness and awareness by the disaster management deptt. In case of any emergency. In this camp 90 birth certificate, 72 PRC, 40 ST certificate,07 marriage registration, 14 labour registration under labour welfare board,19 new application for PMUY, 20 new applications for national old age pension,01 application for National disability pension scheme,02 new old age pension account under Apex bank and 14 farmers got benefits under Veterinary dept. The electrical department collected a revenue of INR 2238, and received request from villagers for shifting transformer from Batse to Lumtsang village.